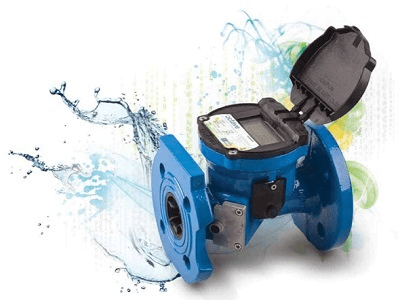 The Arad Octave ultrasonic water meter sends two sets of ultrasonic sound waves diagonally in opposite direction’s across the water filled body of the meter, the difference in the time taken by these sound waves to cross the meter is used to calculate the flow rate. Imagine two identical swimmers crossing a river on the same diagonal line, one with the flow and the other against the flow. The swimmer moving with the flow needs much less time to reach the opposite bank. Ultrasonic waves behave exactly the same way. The sound wave that flows in the direction of the stream moves faster than the one that flows against the stream. The transit times TAB (Transit time of ultrasonic waves from sensor A to sensor B) and TBA (from sensor B to A) are measured continuously. The time difference (TBA - TAB) is directly proportional to the mean flow velocity (Vm) of the liquid. The flow rate is a result of the velocity multiplied by the cross section area of the flow tube size.